The Warriors will now accelerate their 2019 planning as they recruit the Warrior team, continue to develop the Wizards and build on the success of ‘My First Skid’. Isle of Wight ‘Wightlink’ Warriors co-promoters Barry Bishop and Martin Widman emerged from the National League AGM to delight speedway supporters with the news that they had committed the award-winning Island side to another season of on-track action. 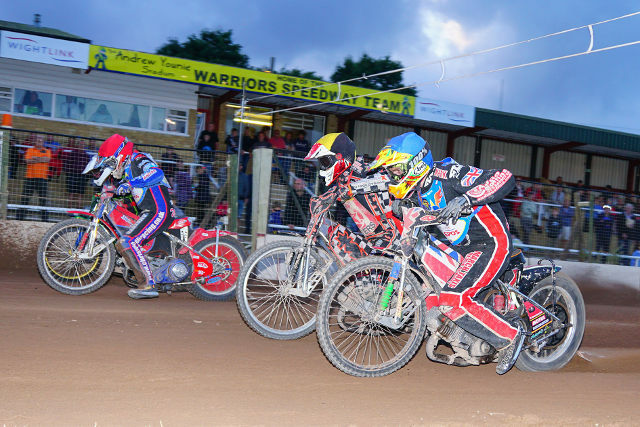 In 2019 the ‘Wightlink’ Warriors will continue to take part in the National League, National Trophy and National League Knockout Cup competitions building a seven-man side to a new combined points total of 36. These team competitions will continue to be supported by Individual, Pairs and Handicap events which have been well received in the past. With Eastbourne and Birmingham planning to step up a level to the Championship and with Buxton taking a year out, the National League will welcome back Cradley into full competition, whilst the Coventry outfit will be replaced by the Leicester Lion Cubs – and the door remains open for further applications from clubs until January. “Martin and I attended the AGM yesterday and whilst we may have not got what we as a club would have preferred, I am pleased that as a League we have probably come away with a team building average which is both workable and one which we hope falls into line with the higher leagues.